Coal Ash Fight Targets Little Blue Run Slurry Pond | "Global Possibilities"
LAWRENCEVILLE, W.Va. — When Beulah Bryant married her husband and moved to this rural corner of the state 50 years ago, she thought she’d died and gone to heaven. “Almost Heaven, West Virginia. That’s where I was at,” Bryant remembers. Now 68 and widowed, she lives under the shadow of the dam holding up what’s known, in a feat of marketing doublespeak, as Little Blue Run, a massive pond constructed in the 1970s as a dump for the heavy-metal laced remnants of coal burned by power plants. Federal officials consider the site to to be among 45 “high hazard” coal ash impoundments nationwide — meaning the collapse of the dam holding back slurry and ash would likely cause a loss of human life. While no one was killed, a massive 2008 spill in Tennessee provided compelling evidence that the dams can fail — a fact not lost on Bryant and her neighbors. “You have this pressure of worrying about this dam letting loose at any time,” she says. While industry advocates and environmentalists offer competing claims as to whether storage ponds like Little Blue Run pollute drinking water or foul the air — or both — one threat is not up for debate: Dams that hold back coal ash can fail with barely a warning. And yet these ponds — often unlined and based on decades-old engineering — remain regulated only by a patchwork of state and local laws. Little Blue Run, which sits almost directly at the point where Ohio, Pennsylvania and West Virginia meet, is emblematic of the large battle now being waged in Washington over federal regulation of coal ash impoundments. The Environmental Protection Agency wants older, unlined impoundments shut down. Not surprisingly, the coal industry and its supporters, arguing that the engineering behind even the oldest coal ash disposal sites is sound, are fighting furiously to keep them open. “Without Little Blue Run, alternate disposal options would need to be considered,” said Mark Durbin, a spokesman for the facility’s owner, the utility First Energy, which is now planning a 225-acre expansion of the site for solid coal waste. For now, the company is not considering those alternatives, leaving residents like Bryant to worry about what would happen if a tsunami of coal ash broke free from Little Blue Run and inundated their otherwise sleepy towns. Bryant’s neighbor Debbie Havens still remembers the knock on the door. She was changing her 3-year-old son’s diapers in her mobile home when a man from a construction company dropped by with a pamphlet and a fantastic story: soon, a 300-acre lake would be carved out of the valley over the hill. By the time her son had grown up, it would be fit for scuba diving. The catch: a layer of coal ash would carpet the bottom of the lake. Since that day in 1975, Little Blue Run has morphed into a nearly 1,700-acre site that glows an eerie Caribbean blue in daytime satellite photos. Calling Little Blue Run a lake may conjure images very different from the reality of a huge impoundment ringed with chain link fence. Its source lies not in some underground spring but a pipeline from the Bruce Mansfield Power Station, in Shippingport, Pa., where up to 24,000 tons of coal day are turned into electricity — making Bruce Mansfield the ninth largest consumer of coal in America. Constructed just a few years after the 1970 Clean Air Act, Bruce Mansfield was the first plant in the country built with a scrubber, a device that removes some toxic smokestack contaminants. The slurry collected by the scrubber is added to coal ash and piped seven miles to Little Blue Run. It contains toxic chemicals that include mercury and arsenic. At the smokestack end, the scrubber meant many fewer pollutants pumped into the air in an era when smog days were distressingly common. Many hoped it was a new day for coal. At the heart of the marketing campaign behind the engineering was the promise peddled to Havens almost 40 years ago –that the pond would one day be converted for recreational use. “Thirty-some odd years from now, an isolated section of Beaver County just south of the point where the Ohio River leaves Pennsylvania may be a fast-growing recreation area,” read an article in the May 1, 1976, Beaver County Times. “Eventually, you may swim and fish in this waste-disposal site,” echoed the Pittsburgh Press. But as the years passed, it became clear that Little Blue Run was unlikely to make that transformation any time soon — if ever. On a recent December day, a ridge near the lake was bracingly quiet, save for rumbles of construction trucks making preparations to expand the impoundment. The impoundment’s transformation into a pastoral lake failed because it never really started. Little Blue Run’s permit was expanded in 1996, and in 2006, power plant owner FirstEnergy again received another permission to keep Little Blue Run growing. The difficulties in finding another site like it, especially in an era when state-level land use permitting has become a nightmare for even the most innocuous of industries, proved too challenging. In support of Little Blue Run, FirstEnergy touts the combined economic benefits of the Bruce Mansfield generating facility and its nearby coal ash impoundment. The planned expansion of Little Blue Run will involve dry storage of coal ash, obviating the need for the pond, which is not expected to be retired until 2016 to 2018. FirstEnergy has hired a consulting company so that when, or if, that closure comes, Little Blue Run might finally be turned into the recreational marvel it was once promised to be. The company points to Lake Wazee, Wis. — an iron strip mine that was transformed into a fishing and scuba-diving magnet with environmental remediation — as an example of what might be possible. But Havens and other residents remain skeptical that the site will ever be reclaimed for safe recreational use — not least because they blame a host of nagging health problems on what they believe are the poisons being dumped at Little Blue Run. On Wednesday, several neighbors of Little Blue Run announced they were filing a lawsuit against FirstEnergy alleging threats to human health. Even though the link to the coal ash dam is unproven, Havens, who lives just down Pyramus Road from the impoundment, is convinced that it gave her chronic obstructive pulmonary disease and asthma. She says she wished she had listened to her gut instinct about the lake so many years ago and fought harder against it — if not for her own sake, then for that of her two grown sons, one of whom recently suffered a heart attack. Late nights, she stays up worrying. “What have I done to them?” she asks. For more than 30 years, coal ash has been considered an “exempt waste” under a 1980 amendment to the Resource Conservation and Recovery Act, effectively curtailing the EPA’s ability to regulate it. That function is then left up to the states. In the case of Little Blue Run, most oversight falls to Pennsylvania. But national attitudes on regulation started to shift at around 1 a.m. on Dec. 22, 2008. That was when a similar dike near Kingston, Tenn. collapsed, destroying several homes and spewing 5.4 million cubic yards of sludge into the Emory River. In sheer size, the spill ranked larger than the Exxon Valdez. In May 2010, the EPA proposed regulating coal ash as a hazardous waste after all — its arguments buoyed not just by the Kingston disaster, but also by a growing number of studies suggesting that coal ash may be a bigger threat to human health and the environment than once thought. A 2007 draft analysis, for example, found arsenic in coal ash from older impoundments like Little Blue Run — many of which were built without the sort of high-tech plastic liners that would be required of any landfill or disposal pond today — could raise nearby residents’ chance of cancer 2,000 times over the EPA’s goal for acceptable risk. The EPA said regulating coal ash as a hazardous waste may cost $1 billion a year. The industry argued the cost would be closer to $13 billion. The White House’s Office of Management and Budget, which calculates the price of new EPA regulations, quietly, but forcefully, pushed back against the agency as well. In response, the EPA proposed a fallback option: regulate coal ash as a “solid waste,” which would impose fewer restrictions, and include a special exemption allowing coal ash waste disposal sites already operating to stay open. But coal defenders like Rep. David McKinley, a West Virginia Republican who represents Lawrenceville, have argued that even EPA’s weaker draft regulations threatened the coal mining at the heart of his state’s economy, as well as a budding industry that makes use of some coal ash components in construction materials. Stopping the EPA regulations, a McKinley spokesman told The Huffington Post, “is vital to the economy and keeping more than 316,000 jobs in the coal industry.” McKinley declined repeated attempts to be interviewed for this article. On the floor of Congress in October, he spearheaded debate on the bill to prohibit the EPA from further regulating coal ash and turn it over to the states. Anti-coal or not, the EPA can point to many places where coal ash has polluted its surrounding: in a 2007 assessment, the agency documented 24 “proven” sites where environmental damage had occurred, and another 43 where it might have. Environmental advocates say they believe they have identified an additional 39 sites, including Little Blue Run, with contaminated groundwater or surface water. There are still many in the industry who dispute the notion that the mercury, arsenic, cadmium and other heavy metals in coal ash occur at high enough levels to cause cancer or heart disease. But it is increasingly untenable to argue that those chemicals are not seeping into groundwater in many places across the country. No one disputes that the Kingston spill very well could have killed someone. The mud wave it launched swamped 12 houses, and only by a stroke of good fortune was no one caught directly in its path. That points to another reason why the EPA is so keen on regulating coal ash. When the waste material is stored as a liquid, it is very often held up by dams or dikes. And besides asking dam owners for voluntary responses to engineering questionnaires, the EPA can do nothing to make sure those structures are safe. When an updated emergency plan was sent out in 2010, nobody from FirstEnergy passed it along to him, he says. Even worse, in his mind, is the escape route from Glasgow up Smiths Ferry Road. In February 2010, a report commissioned by the EPA on Little Blue Run’s safety found that if something went wrong, the “factor of safety” for a rapid drawdown of water was below U.S. Army Corps of Engineers guidelines, the standard in the dam safety world. That essentially means that were a massive storm to hit, for example, Little Blue Run’s managers would be hard pressed to quickly empty the impoundment of water. 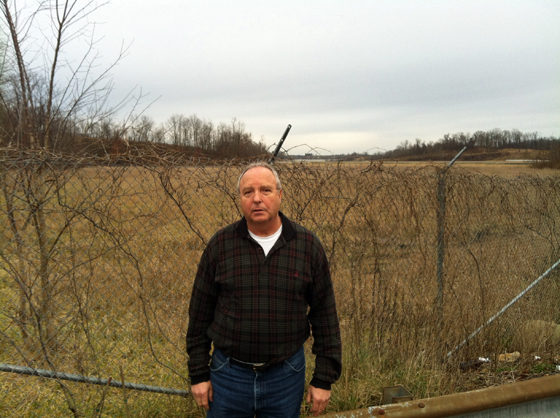 By its own admission, FirstEnergy has no written plan to quickly release impounded water. 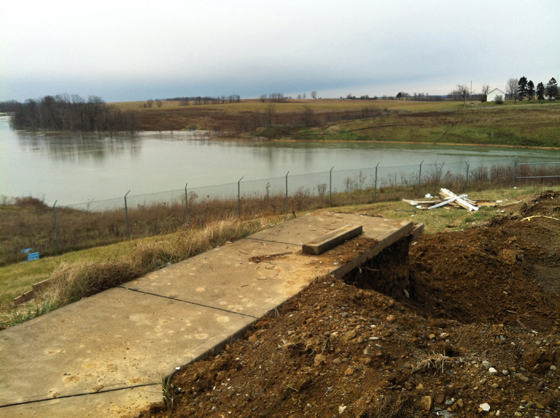 If forced to quickly empty the impoundment to release pressure on the dam, the company says, “Any water withdrawn would be discharged downstream of the dam and eventually flow into the Ohio River.” After the EPA subcontractor issued its evaluation, FirstEnergy commissioned its own “updated” analysis in March 2011. It found the safety factor for a rapid drawdown was actually above what the Corps of Engineers recommends. Property records show that since July 2011, FirstEnergy has purchased at least four properties near Little Blue Run for a total of $609,000. The company refused to comment on those purchases, but residents believe it is responding to their concerns about environmental contamination — and perhaps paving the way for the impoundment’s expansion. Kerry Vaughner, 37, is one of those who was bought out. A high school biology teacher and mother of two, she says she was shocked by the destruction Little Blue Run has wrought on her neighborhood’s fabric. The damage, she says, will be not just to her family or her street, but to the state as a whole. All this has happened before. Beset by neighbors complaining of well water pollution and confronted with the need to expand its coal ash dump, FirstEnergy bought out almost all the residences on the Pennsylvania side of Little Blue. Where a nursing home once stood, the sidewalk stops abruptly, pointing towards the impoundment. Former building overlooking Little Blue Run.Not everyone has followed Vaughner’s lead. But as the impoundment continues to grow, health concerns are being multiplied by worries about the structural safety of the dam. That’s cold comfort for Beulah Bryant, whose daughter and granddaughters also live in Lawrenceville.